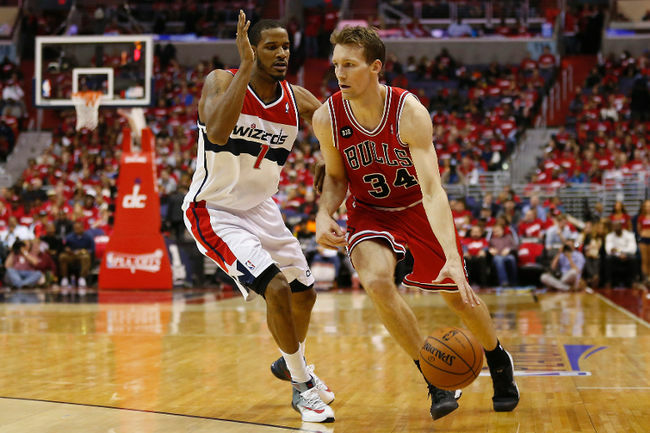 Game 3 hero Mike Dunleavy makes a play off the dribble during his game-high 35-point effort Friday night. Game 3 of the Wizards/Bulls Eastern Conference quarterfinal series will go down as one of the greatest and most eventful playoff games in Chicago Bulls history. With the score tied 86-86 with 3:50 to go in the fourth quarter you could feel the entire pulse of the city of Chicago collectively locked-in to this game, and that’s in spite of the Blackhawks being in a similarly tense do-or-die game at the same time. This 3-minute, 50-second stretch to lie ahead was no less than the season’s climax, boiled down to its essential elements — either succeed and renew your life as a playoff team or lay down and suffer a memorable fail not only for this year but for the history of the Bulls organization. This series marks the first time in the Bulls history that they have been down 2-0 in a series in which the first two games were in Chicago, and we all know that going down 3-0 is pretty much a death sentence in the NBA playoffs. But as (I hope) you saw last night the Bulls triumphed with some toughness and perseverance straight out of a Stallone movie. We also saw coach Tom Thibodeau switch up his crunch-time strategy somewhat (even if it was obvious that he had to) and I commend him for that. Now to breakdown how the newly-underdog Bulls won an intense game that was made more enthralling by poor free throw shooting, an MMA fight and classic performances from a pair of Duke alumni. On Twitter, near the game’s beginning, I joked about how many shots Dunleavy should take, but I greatly overestimated how many shots a coach’s son would need to be effective in this setting. We don’t know what coach Thibs said to him before the game, but whatever it was worked. Dunleavy played like a man possessed, hitting eight of ten 3-pointers, a new single-game franchise playoff record, and scoring 35 points in all. Scottie Pippen made the previous high mark of seven 3s in the 1997 Finals. What was so impressive about this feat is that Dunleavy did not force a single shot. It just took a few layups at the start of the game to get him going. Whether it was shooting off of a pin-down screen, curling from a down screen, or shooting in transition, Dunleavy was effective at every turn in hitting from deep. As that crucial 3:50 mark to end fourth began, the Bulls’ next score was *insert drumroll* a Dunleavy three. Watching Dunleavy put on a clinic on good shot taking and big shot making was like watching a game of NBA Jam, but because NBA Jam was a two-on-two game so I can’t leave out fellow former Dukie Carlos Boozer. Obviously, Boozer didn’t have the game that Dunleavy had but he easily had his best game of the series. The Bulls’ issue has been scoring points, so I felt that giving Boozer more minutes would somewhat remedy the problem. Unfortunately, coach Thibs didn’t care about my suggestions and only gave Boozer around the same minutes he’s always gave him (24 minutes Friday, 23.1 per game this series), but Boozer did step his game up. Maybe inspired by his Blue Devil buddy, Boozer did not take one bad shot on the night. He shot 50 percent from the field and actually attempted to play defense. Boozer and Dunleavy are two of the three offensive-minded players on the Bulls (with DJ Augustin being the other); in order to win this series Chicago needs their offensive-first players to stay aggressive. Nene sports a smirk walking off the court after being ejected for his confrontation with Jimmy Butler. X-Factor(s): Nene “I can’t stop grinning” Hilario and Jimmy Butler combined to earn this for Game 3, but for very different reasons. 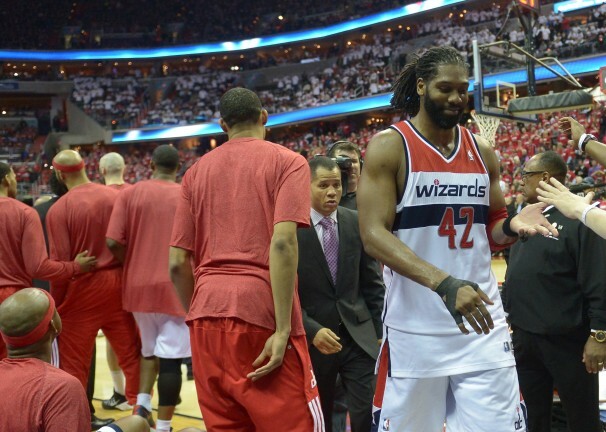 Nene and Butler got into a normal NBA playoff scuffle in the fourth quarter. Butler appeared to have tossed a little trash-talk Nene’s way, and he responded by going head-to-head with Butler (literally) and then putting Jimmy in a Muay Thai clinch (again, pretty literally). This was important for two reasons: Nene got ejected (all while still having that damn irksome smile on his face) and Butler got fired up and inserted himself as one of the game’s deciding factors. This postseason Butler had not lived up to the “Jimmy Buckets” nickname, scoring 12 points a game with an abysmal 22% 3-point percentage. But Butler was obviously fired up after Nene tried to spar with him, hitting his first long range shot in what seems like ages at the 8:08 mark in the fourth and then one-upped himself when he gave the Bulls its final lead change with another 3-pointer with 24 seconds left. Jimmy gets buckets indeed. Nene on the other hand was thwarted throughout the night by Joakim Noah, him finally performing this series like the Defensive Player of the Year he now is, hounding Nene into 33% shooting in his 29 minutes. Silver Lining for Bulls: The silver lining in this game was obvious: the Bulls have found some offense. Chicago’s defense has been enough to keep them in games, while their lack of shot-makers has slid them out of games. Dunleavy re-gained his stroke, and Thibs made the smart decision to ride the hot hand rather than sticking to his predetermined fourth-quarter rotation. The Bulls need to continue get their shooters in a rhythm so they won’t go through such extended scoring droughts late in games. Surprisingly, the Wizards outscored the Bulls 50-34 in points in the paint. This is usually a Bulls strong suit, but the Wizards protected the rim well. Chicago was also weathered the first big game from John Wall (23 points, 7 assists, 4 steals). The Bulls were bested by the Wizards from the free-throw line as well (Bulls, 66%; Wizards, 71%), which is shocking considering that the Wiz ranked as one of the worst free throw-shooting teams this year (and dead last among the playoff teams thus far). The fact that the Bulls could still pull out the victory when being dominated in such categories that they usually excel at should only further boost the Bulls’ confidence. And now that Chicago has avoided a 3-0 hole, I look forward to seeing a very emotional and tightly-contested Game 4 Sunday. With a victory here, the Bulls will have successfully heaped all of the pressure back onto the young, still unproven Wizards and coach Randy Wittman with a series truly in the balance, something I am not sure they are quite ready to handle.